Mosh September 12, 2018 Tours/Live Dates No Comments on Jaret tour kicks off soon, Bowling For Soup back with Patent Pending in Nov/Dec! I’m a complete “Bah, Humbug”, so when someone says it’s Almost Christmas I cringe and think about how exactly I want to flay them. 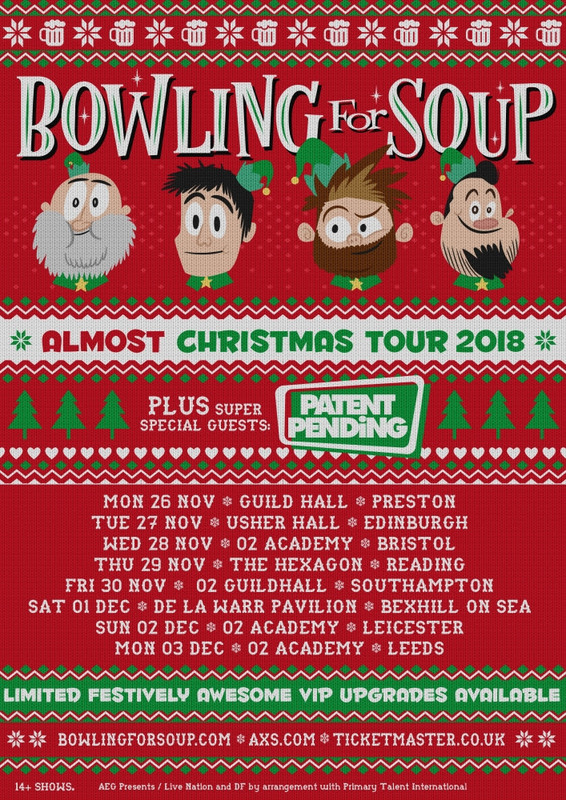 Then I find out that this is the name of the forthcoming Bowling For Soup tour, and that they’ll be bringing bouncy New Yorkers Patent Pending with them and I get all forgive-y and stuff. 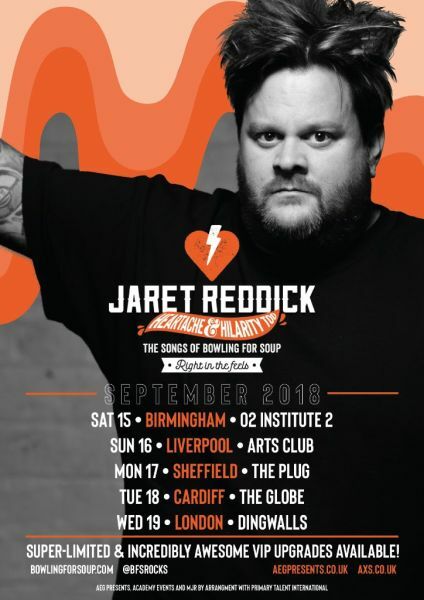 Frontman Jaret is in the UK from the 15th – 19th September on the Heartache and Hilarity Too solo storytellers tour (supported by The Dollyrots and Lacey) so you can treat that as a warmup if you’re lucky enough that one of the dates is near you. Both support acts will be performing acoustically with some fantastic re-workings of both band’s most popular songs. There may also be the first opportunity to hear performances live from Jaret and Kelly from The Dollyrots’ new duets project – Jaret and Kelly Sittin’ In A Tree! As I think back on our history of UK touring, it dawns on me that we have never been there in December. At least I don’t remember being there…could be the pints! Regardless, I thought, who likes Christmas as much as we do?!? PATENT PENDING!! And who more than both of us?!? PEOPLE IN THE UK!!! So we reunited with our little brothers, Patent Pending, to bring our first ever Christmas tour (well, almost!!) to the UK!!! Tickets for the Almost Christmas tour went on fan pre-sale, O2 pre-sale and venue pre-sale (where applicable) today. Tickets go on general sale Friday September 14th at 10am. Please check www.bowlingforsoup.com for full details.